Have you been just slightly disappointed by your home-grown fruit and veg? In the last two summers, I’ve grown celeriac with no roots, blighted tomatoes, stunted sweetcorn and lettuces that ran up to flower before we could eat a single leaf. Admittedly, we’ve also enjoyed eating our own beans, courgettes, chard, basil and chillies. But I decided it was time to go back to veg-growing school to find out what was going wrong with the rest of it. Thirteen years ago, the Sarah Raven Cutting Garden course got me off to a good start when I was faced with a newly-acquired middle-sized garden and very little idea of how to deal with it. Since then, I’ve been on many gardening courses and talks, and have read countless books, magazines and blogs about gardening. I wasn’t, therefore, quite sure what level course I needed. Year Round Veg was pitched exactly right for me – the others on the course (about 30 of us) ranged from town gardeners who had just acquired an allotment to people who ‘have dabbled in veg growing but want a system’ and those who were already growing some veg (like me) but wanted more successes, fewer failures and a longer season of eating their own home-grown food. There were quite a few husband-and-wife or mother-and-daughter pairs enjoying a day out together, and one professional gardener wanting to sharpen up her veg-growing skills. In fact, Sarah explains things so clearly that you could be a complete beginner, too. At the heart of Sarah’s successful veg growing is an easy, home-made grid system. She advises you to write a list of the veg you’re planning to grow, and assess each one against a list of key questions. How much space does it take up? How long from planting to harvest? How easy is it to buy in the shops? How long does it crop for? What’s the taste difference between home-grown and bought? Is it easy to grow? How flexible is it in the kitchen? And, most crucially, how many colanders of produce do you get for each sowing? There are other factors you can include according to your taste – such as ‘is it ornamental?’ ‘How much would you like to impress people by growing unusual varieties?’ and so on. 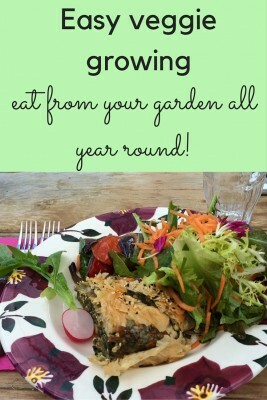 And, of course, you need to grow veg you will want to eat. Sarah pins a paper to her fridge door and writes down which veg she’s used that day until she’s got a representative sample of what the family eats most. I make my list by going through my favourite cookbooks. Looking at the grid, you will quickly see which vegetables are worth growing. For example, Savoy cabbage gives you one colander of harvest in a season and takes 7-8 months from planting to harvest. While the same amount of Swiss chard will go from planting to harvest in 8-10 weeks and is cut-and-come again, giving you about 60 colanders of leaves a season over a period of about 6-8 months. It can even be grown in pots. The vegetables that triumph in the grid are mainly the cut-and-come again varieties: chard, kale, beans, salads and herbs. The way you harvest your home-grown veg can make a big difference to how much veg you get and how long the season lasts. Sarah has trialled two ways of harvesting cut-and-come again lettuces at Perch Hill. The first is to cut the lettuce off a few inches above the ground leaving enough of the leaf to allow the lettuce to re-generate. The second way is to pick 2-3 individual leaves going round. This second way increases harvests by up to one third, because the plant goes on producing for longer. However, if there’s any sign that the lettuce, kale, chives or chard is coming up to flower, cut right across the plant instead. This is certainly one place where I have been going wrong – I do pick around but just haven’t cut chard, lettuce and rhubarb down across quickly enough at the first threat of a flower. I will be out with the scissors every morning from now on. 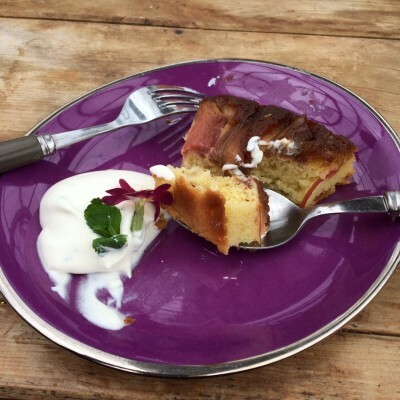 We were served delicious rhubarb cake from the garden…. Rhubarb, in particular, Sarah says, benefits from being harvested ‘hard’. Ha! I’ve stepped nervously round my rhubarb, wanting to ‘save’ it. I should have been wading in there and wrenching off stems (carefully) around twice a week. I’ve always assumed that winter veg meant the space-consuming ones: parsnips, brussels sprouts, Jerusalem artichokes etc. In fact, coriander will give you a much longer crop during the winter than it will in the summer – it likes cold, damp weather. It bolts in summer. Wild rocket and Swiss chard are the same, and some of the lettuces, along with parsley and chervil. (Some need protection of a greenhouse or polytunnel – but you can get mini-versions of both.) Sarah recommends using horticultural fleece on a regular basis, to protect plants from the cold, but also to stop flea beetle getting at your rocket. 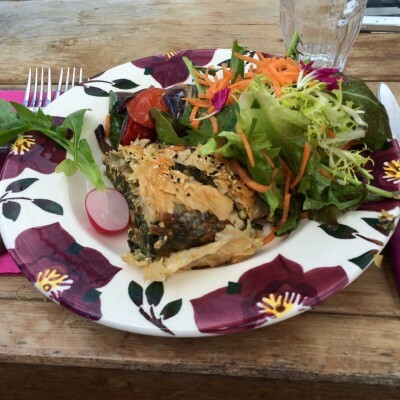 Salad cut from the garden, spannakopita made with kale from the garden and edible flowers – lovely lunch! Sarah also shared her ‘perfect salad’ secret, told to her by a Kent salad farmer. 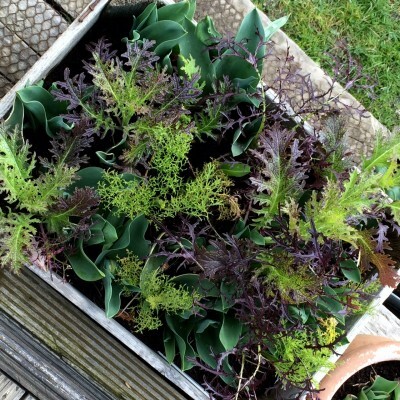 ‘You need a base (eg lettuce), then you add a salad leaf, such as rocket or mizuna. 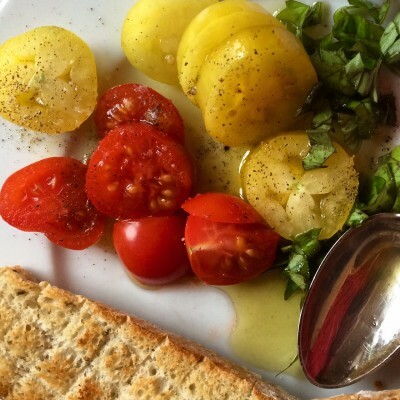 Add a salad herb (choose something that goes with the main meal you’re going to eat). Then a salad veg, such as bulb fennel or cucumber, sliced very thinly with a mandolin. Finally, top your salad with an edible flower. Primroses, violas, dahlias and marigolds are all edible. Questions from other people help to identify your own problems. For example, somewhere along the day, I realised that my celeriac had probably suffered from being planted too close together and in a very crowded bed. I must add a good ruler to my gardening kit bag. And use it. Admissions of failure can help, too (including Sarah’s own: ‘I always regret planting sweetcorn, it’s so hit and miss – although the flavour is definitely superior to shop-bought sweetcorn.’). There’s my sweetcorn question answered. It’s a relief to know that even people whose business is growing veg in gardens find sweetcorn difficult. Looking back, my good sweetcorn harvests were all when we first came here, and there were a couple of really hot summers in a row. And it’s a good to know that other people find spinach trickier to grow than chard. I might as well stick with the chard, which crops prolifically and doesn’t wilt down to nothing in the cooking process. I think you can only get this kind of feedback when you go on a course. Books often make everything sound breezily easy – which encourages you to try, but makes you feel it’s all your fault when it doesn’t work out. Everything at Perch Hill is trialled on a very domestic basis. It is hardly a ‘middle-sized’ garden, but the individual planting areas are quite home-garden sized. So planting the same patch of land up with twice as much is a very useful tip. Sarah grows winter salad leaves ‘on top of’ tulips. And it looks beautiful, too. She also cautions gardeners in small spaces to avoid dwarf varieties, but to go for using veg that climb – so you’re using the air to extend productivity. 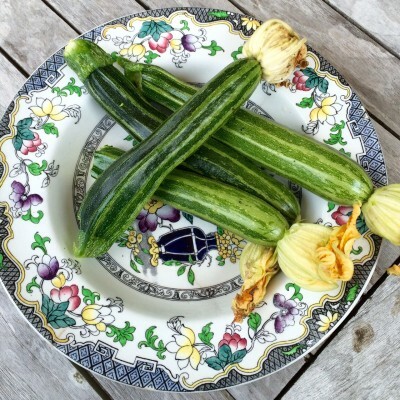 Good climbers for veg growers include La Diva cucumbers (which don’t need a greenhouse), Tromboncino summer squash that you can eat young as courgettes or let them grow into squashes and, of course, cherry tomatoes, beans and peas. Cherry tomatoes are prolific and grow up on a support, so make a good use of space. Have 2 sowings of basil – one in April and the other in August. If you’re growing seeds on a window-sill, cover a piece of card with foil and prop it against the back of the seed tray (furthest from the window). The light will bounce off the foil-covered card and the seeds will be less leggy and healthier. 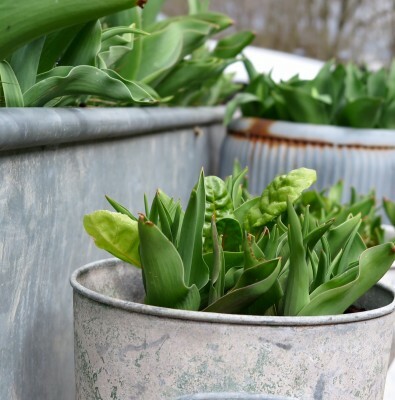 As you’ve probably seen from these photographs, I also found the pots inspiring. (There’s a very tempting ‘Pots at Perch Hill’ one-day course,too). 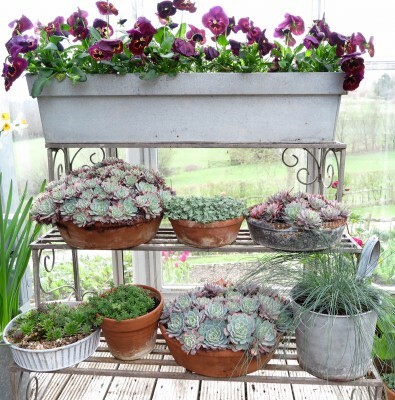 Pansies and succulents displayed at Perch Hill. The pansies are edible. I’d really recommend a course at Perch Hill, because it’s an enjoyable and inspiring day out as well as highly informative. I came back feeling that I knew where I’d gone wrong, confident that I was better equipped to get it right – and that sometimes failure is just part of the gardening experience. 9 comments on "Easy veg growing for year-round success"
This is a wonderful post. I read your blog regularly but this time I feel i must comment. I so often think about the matters you have discussed after the season ends but fail to act on them for the next season. So often greed for too many plants planted too closely, lust for things that I know won’t thrive and sloth, by not preparing my beds early enough can all be overcome by the practical issues you raise. The list on the fridge should have been obvious to me, but how clever. It is winter here in my part of the world but I will certainly be making my lists and taking your advice on board as I approach spring. Thank you for a lot of great ideas. Well, you have veg growing issues we here in the UK can’t imagine – we mainly worry about slugs, snails and rabbits, whereas I know you have to deal with possums, kangaroos, wallabies and forest fires. It’s a real triumph that you get any veggies out at all. I do think about you all in Australia when I am netting my plants – at least I don’t have to use several layers of chicken wire! There are both chilli and tomato varieties that are bred for hanging baskets, and they look lovely. Thompson & Morgan do two varieties of tomato for hanging baskets, and a chilli called Cayenetta, and there are probably options at your nearest garden centre or nursery. Good luck with it – hanging baskets will definitely need regular fertilising, by the way. Lots of brilliant tips there, sounds like a fab day out. I love the idea of growing salad leaves with tulips. Wish I was nearer! Well, if you do get over that way, there are lots of great gardens to pack in as well – Great Dixter, Sissinghurst, Charleston…and loads more.